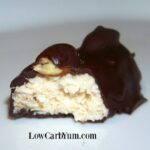 Low carb donuts are a special treat that will make you feel like you are cheating. 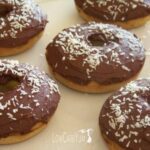 These chocolate iced coconut donuts are the best I have made so far. They are also gluten free. Lately, I’ve been eating a lot of chicken and salads which is pretty boring. My husband got a gift card to Dunkin Donuts from one of his clients. He doesn’t drink coffee so he is saving it to buy donuts for him and the kids. My husband knows I rarely eat sugar loaded donuts. The gift card has been sitting on the kitchen counter since Christmas and it has led to a donut craving. 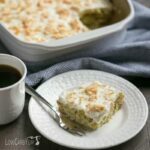 My favorite donuts are the Krispy Kreme chocolate iced cream and I need to work on how to get that luscious sweet cream filling in a low carb version. Eventually, I’ll figure out a good low carb alternative to those cream filled donuts. Since I have a donut pan I just needed to make up a cake batter to bake in the molds. Coconut flour does a good job with cakes so I figured it would make a good base for the donut batter. 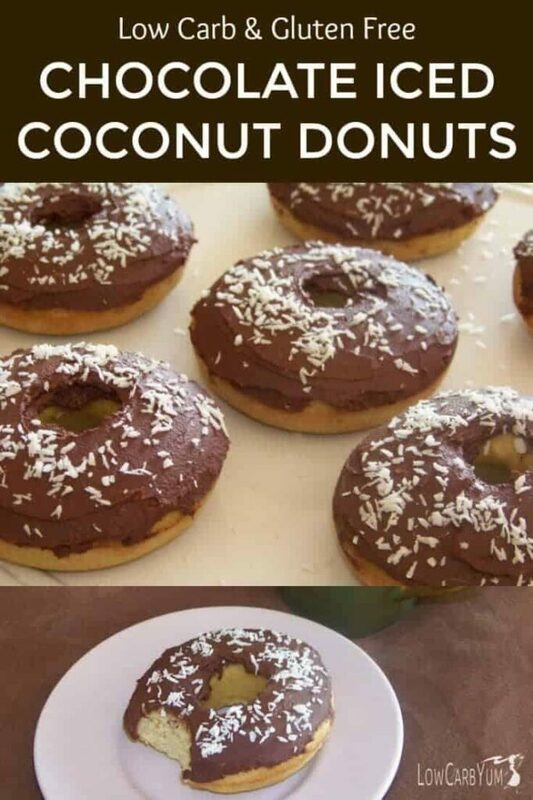 This got me thinking about a coconut donut. So, I threw some unsweetened dried coconut flakes into the batter. The resulting donuts weren’t very attractive so I whipped up some chocolate frosting to spread on top. Still not satisfied with how they looked, I lightly toasted an additional tablespoon of shredded coconut to sprinkle on top. The result? Perfectly delicious! I was in heaven when I ate each coconut donut. 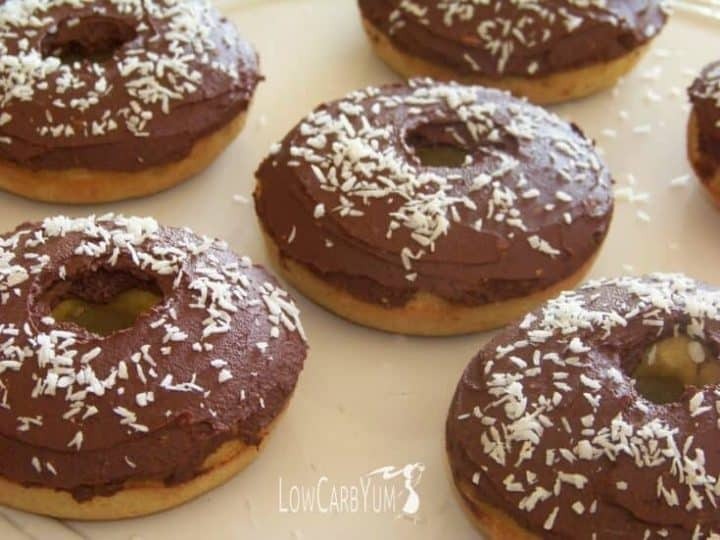 The chocolate icing really complements the coconut flavor of these low carb donuts. I’m really excited by how well these treats came out. 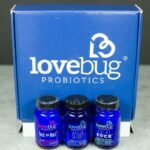 It just goes to show that you don’t need to deprive yourself of an occasional treat. Of course, you should always eat sweets in moderation. I’ve found that the less sweets I eat, the fewer I want. And, that helps me keep my daily calories in check because sweet tastes do tend to increase my appetite. These donuts have the look and feel of the real thing. 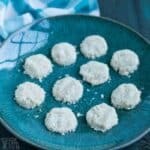 They are relatively easy to make and will get you past any sugar cravings. The sweet taste goes perfect with my morning coffee! I’ll have to experiment with this basic batter to see what other scrumptious donut flavors I can create. Maybe a nice glazed chocolate or blueberry donut reminiscent of the other popular donut chain. Just take a look at how these babies turned out. The photos alone are enough to make your mouth water. I have made blueberry cake donuts using a different batter. 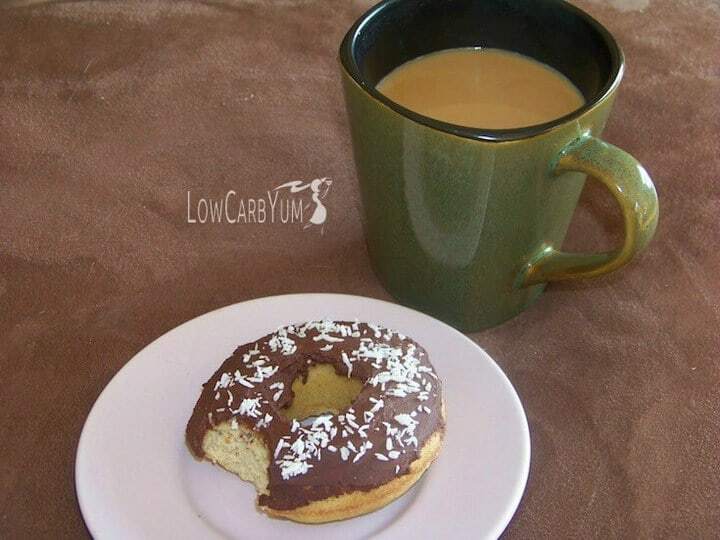 These coconut low carb donuts are still my favorite, though. I’ve also made banana nut muffins in donut shapes. 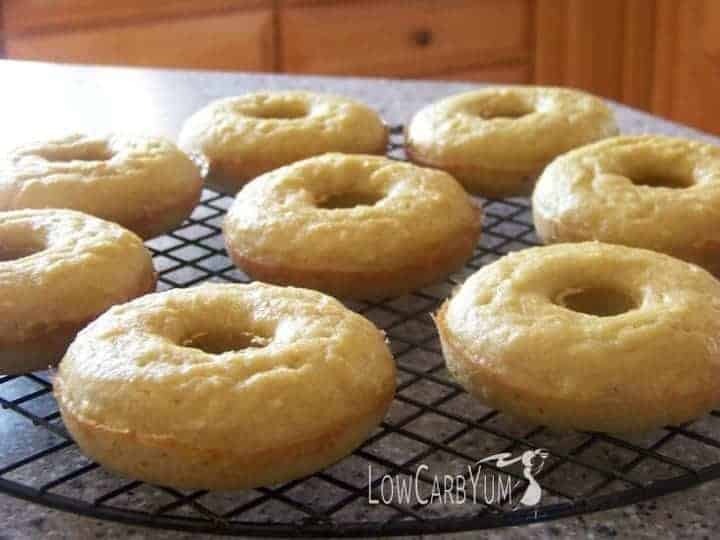 You can really make any low carb quick bread into donuts using the donut pan. 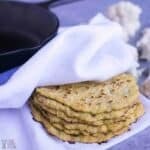 You can even make low carb bagels using the circular baking molds. Donuts are a special treat. 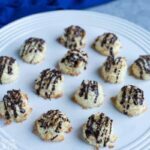 These low carb donuts are the best donuts that I have made so far. They have great coconut flavor and are gluten free. 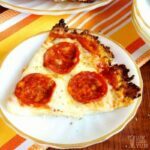 Mix together coconut flour, coconut, erythritol, stevia, salt and baking soda. 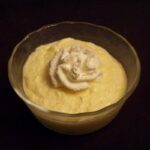 Blend in eggs, coconut oil, almond milk, and vanilla extract until well combined. Fill donut molds about 2/3 full with batter. Bake in 350 degrees F oven about 20 minutes or unitl toothpick comes out clean. 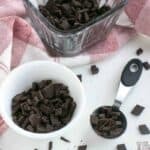 Beat butter with cocoa, erythritol and stevia. 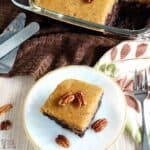 Mix in almond milk and vanilla extract. Beat until well blended.